Two | How Could a Good God Allow Suffering? Five | How Can a Loving God Send People to Hell? A God of Judgment Can’t Be a God of Love. “I Believe in a God of Love”. The Concept of Moral Obligation. The Problem of Moral Obligation. The Argument for God from the Violence of Nature. The Endless, Pointless Litigation of Existence. The Social Consequences of Sin. The Cosmic Consequences of Sin. The Story of the Cross. The Empty Tomb and the Witnesses. The Explosion of a New Worldview. Why did Christianity emerge so rapidly, with such power? The Future of the Dance. Making the Move. The first thing you have to do is repent. (243) The second thing you have to do is believe in Christ. (244) [that is, to trust]. There’s much to commend in this thorough book. Keller does a good job presenting a broad sweep of the arguments, summarizing tomes of literature on each particular subject. For that, this work is to be commended. Doubt, like faith, has to be learned. It is a skill. However, he suggests elsewhere in the book that faith is part of the human condition. Considering what we understand about the uncertainty of faith (a point of discussion he glosses over), should not doubt also be considered innate in the human condition? This point is important because it could reduce the validity of doubt and its role in the entire enterprise of a faith journey. There will be a couple other places where this is a point of disagreement between Keller and I. Faith, religion, or even God as an “explanation” is an unsustainable philosophical assertion. I’ll explain more with a later quote (see below), but for now, I would suggest that religion is best understood as providing meaning, and purpose through stories and, yes, even some “explanations.” But to relegate religion to an “explanation” is actually some augmented form of the “god of the gaps” stance, which is philosophically (and theologically) untenable. It is possible that this terminology is simply a slippery slope of misunderstood vocabulary — or semantics — but I do think this is important enough to clarify. Christianity not only leads its members to believe people of other faiths have goodness and wisdom to offer, it also leads them to expect that many will live lives morally superior to their own. While I concur with the gist, the force of the statement left me unsettled. Christians should expect that many will live morally superior? By what standards? And how is this argument helpful? Does this stem from a utilitarian view of Christianity? Does this leave Christianity out of the “moral progress” category, in which, perhaps, other religions, philosophies, or worldviews are better? There seems to be lots of potential problems with this. We cannot skip lightly over the fact that there have been injustices done by the church in the name of Christ, yet who can deny that the force of Christians’ most fundamental beliefs can be a powerful impetus for peace-making in our troubled world? This is a follow up to the quote from page 19, that this is a bit utilitarian, and not a strong argument. Who can deny the force of Christians’ most fundamental beliefs? Well, pretty much anyone who looks closely at how Christians act, behave, and the basis of beliefs upon which they act. This feels very weak to me, which needs further support and even perhaps a completely different approach to the argument. Just because you can’t see or imagine a good reason why God might allow something to happen doesn’t mean there can’t be one. 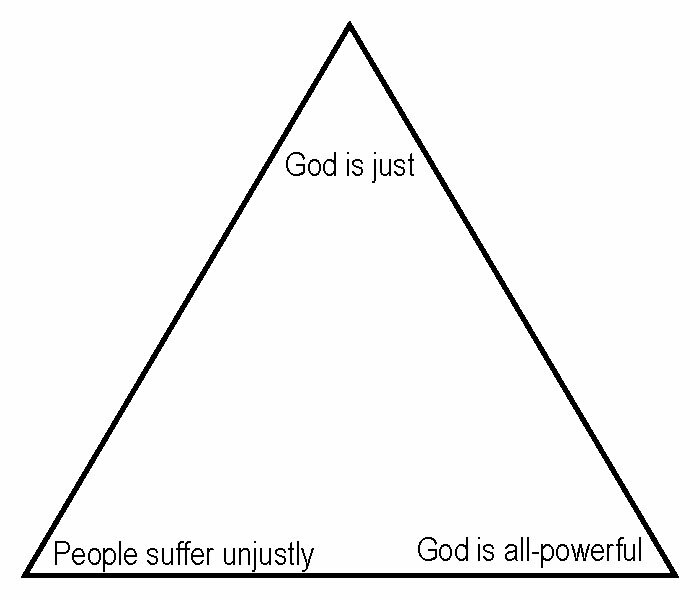 Of the three corners of the theodicy triangle, Keller is cutting off one of them, which does not answer the question of theodicy, but merely assumes one possible explanation. If you have a God great and transcendent enough to be mad at because he hasn’t stopped evil and suffering in the world, then you have (at the same moment) a God great and transcendent enough to have good reasons for allowing it to continue that you can’t know. Indeed, you can’t have it both ways. In addition to the previous explanation, this statement is simply disconcerting, and non-explanatory. It’s a bit pointed. And, it adds the complexity (and dismisses the reality) of the observation that some evil and suffering is completely counter to the doctrines of God and “biblical theology.” In other words, you can’t have a God that allows evil and suffering in the world for good reasons, if the very evil and suffering are contrary to the goodness of God. You can’t have this both ways either. In addition, this perspective can make God out to be an arrogant brute, slightly masochistic, explaining nothing about the nature of God, only discouraging our pursuit of God in the midst of evil and suffering. On page 26, Keller delves deep in to the other argument which is that evil and suffering may be evidence of God. The problem is that this completely contradicts the previous argument. If — according to the previous argument — there are good reasons for evil and suffering and we simply cannot know them, then that explanation dismisses the categories of evil and suffering and therefore cannot be used as explanations or evidences for God. Again, you can’t have it both ways. Either there are good reasons, or there aren’t good reasons. It seems that the stronger of the two arguments is the later — what I would argue — is that the very definition of evil and suffering is that there are NO GOOD REASONS, which would be an argument for God’s existence, a standard by which we judge what is right and wrong, evil and good. Keller seems to want to try his hand at both, and I simply don’t think this is philosophically tenable. On page 59, Keller does not provide a full explanation of what “full commitment to Christ and his gospel” means. While this comes a bit in the second half of the book, the reason why it is noted here is because he is arguing directly that the Christian commitment is being misunderstood, misapplied, and misrepresented, yet he offers no cogent corrective. Why is this important? How are we to understand his explanation of Christianity in contradistinction with the “lesser” Christianity that he is critiquing? We should not be surprised to discover it was the Bible-believing religious establishment who put Jesus to death. For the sake of argument, let’s imagine that Christianity is not the product of any one culture but is actually the transcultural truth of God. If that were the case we would expect that it would contradict and offend every human culture at some point, because human cultures are ever-changing and imperfect. If Christianity were the truth it would have to be offending and correcting your thinking at some place. Maybe this is the place, the Christian doctrine of divine judgment. This makes no sense to me on several levels. First, why must the truth of God be contradictory? Offensive? If that is the case, then what about the Christian faith resonates with the human soul? I recognize this may be a bit unfair, but the statement is quite sweeping, and I’m addressing the wholistic nature of it being all-encompassing. Second, Christianity comes through human culture. The complexity of the expression of the truth of Christianity cannot be divorced from its human vessel, and that goes for Keller’s Christianity. His statements about the truth of Christianity are culturally conditioned, just like Christianity has been throughout history. If this view of the New Testament’s origins and development is true, it would radically change our understanding of the content and meaning of Christianity itself. It would mean that no one could really know what Jesus said and did, and that the Bible could not be the authoritative norm over our life and beliefs. It would mean that most of the classic Christian teachings — Jesus’s deity, atonement, and resurrection — are mistaken and based on legends. In referring to the transmission of the New Testament, Keller simply states an epistemological either/or. But is this premise and conclusion accurate? History is much more complex than simply equating a transmission of a text and the truth and validity of a historical person. AND, equating a historical person with the theology about the person is also much more complex and gray than this simple statement suggests. None of these details are relevant to the plot or character development at all. I completely disagree. Given the scarcity of writing, the import of the written word, and the space allocations and cost of putting pen to paper, every jot and tittle has significance. In the example he refers to, Jesus writing in the dust with his finger, is wrought with allusions to Jeremiah 17, and the prophetic voice. This is deeply relevant to the plot, and character development of the story. I suggest that every detail we find in the New (and Old) Testaments are important. Keller’s dismissiveness of these details betrays his own perspective, that there is a hierarchical message found in the pages of the New Testament. How does he determine what the most important message is? Well, through his own culturally shaped theology. We should make sure we distinguish between the major themes and message of the Bible and its less primary teachings. The Bible talks about the person and work of Christ and also about how widows should be regarded in the church. The first of these subjects is much more foundational. Without it the secondary teachings don’t make sense. We should therefore consider the Bible’s teachings in their proper order. I simply do not understand, nor does Keller explain, how he formulates this hierarchy. Again, it can be deduced that this comes from his culturally shaped theology. It is therefore important to consider the Bible’s core claims about who Jesus is and whether he rose from the dead before you reject it for its less central and more controversial teachings. And I would say that for readers of the Bible, and especially conditioned by reformed theology (sola scriptura, infallibility, etc.) that option has not been left up to us. If you concede there are “core claims” about the Bible juxtaposed with “less central and more controversial teachings,” you create a “canon within a canon” that is not compatible with “infallibility,” “inerrancy,” or even some tenets of “inspiration.” Or on the flip side, recognize that the whole Bible is important to the central running message and themes, every jot and tittle and we should consider them in light of their importance; at the very least, in how the authors of the Bible suggest their importance. This unfulfillable longing, then, qualifies as a deep, innate human desire, and that makes it a major clue that God is there. The problem with the “desire” argument is that there are some people without the desire. Does that make God absent? This is a contingent and fragile argument. 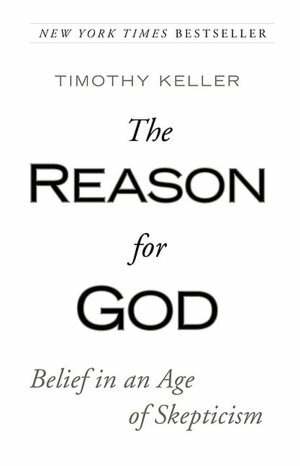 In Chapter 8, Keller expounds upon what I have deduced as “God as an explanation,” some reasoned or rational conclusion. This is philosophically problematic. First, if we accept God as an explanation, this is an augmented “god of the gaps” argument which is untenable and fallacious. Second, it presupposes that God can be, or is some explanation, which implies a certain epistemological tangibility. But if we conceive of God as bigger and outside of rationality, as mysterious, elusive, and beyond our understanding, then by God’s very nature, our explanations are deeply flawed, sorely miscalculated, and at best ephemeral throughout the course of human history. I might put it this way: God gets lost in the explanations of God. I suppose this is a bit of an augmented “Heisenberg’s Uncertainty Principle,” that as soon as we try to explain God, we have miscalculated God’s presence, location, direction, and speed. Turning God into an explanation, as Keller does, reduces God to an explanation, and this seems contrary to the Biblical and Christian theology. Though we have been taught that all moral values are relative to individuals and cultures, we can’t live like that. But, we do. Morals are subjective. He doesn’t talk once about the philosophical understanding of absolute morality, which is more substantive. He simply discusses moral sense, perception, and application, which is problematic for his argument. A life not centered on God leads to emptiness. This statement is anecdotal, subjective, and contingent upon contrasting with a life centered on God. In other words, a life not centered on God not knowing God would not necessarily lead to emptiness. One would have to know about the alternative in order to make that judgment. I will grant that, on the whole, churchgoers may be weaker psychologically and morally than non-churchgoers. That should be no more surprising than the fact that people sitting in a doctor’s office are on the whole sicker than those who are not there. Churches rightly draw a higher proportion of needy people. They also have a great number of people whose lives have been completely turned around and filled by the joy of Christ. I’m so sorry to say that I found this statement misrepresentative, quite demeaning, and I could imagine in some circles, offensive. I’m a bit at a loss for words, for how can this even have any merit considering the vast and wide spread ubiquity of psychologically and morally corrupt people regardless of their church affiliation or attendance. Granted, churches should be attracting hurting, broken, and desperate people. But that — a mission and value statement — is far different from an analysis of real people who actually attend or do not attend. To evaluate attendees as somehow “weaker” psychologically or morally is simply astoundingly ignorant, and a bit repulsive. Would he say the same about the people attending his church? NOW, with that said, I must come full circle and say that in spite of my critiques (which is often a sign of respect for the author), I still commend the work, and the introduction that this can have for anyone wrestling with these issues. There are fantastic quotes, good research, and much to launch someone into further discovery. However, it is far from the substantive work on each subject, and for each category, if time and interest permits, one would do well to simply turn to the bibliography and begin working through those books in lieu of reading the chapters. However, I am a firm believer in “whatever gets you through the door.” Bless God for the work and contribution this book makes to the Christian and global community, and may it continue to push us further, deeper and deeper in to the truths that lay so close and yet so far away from our hearts.